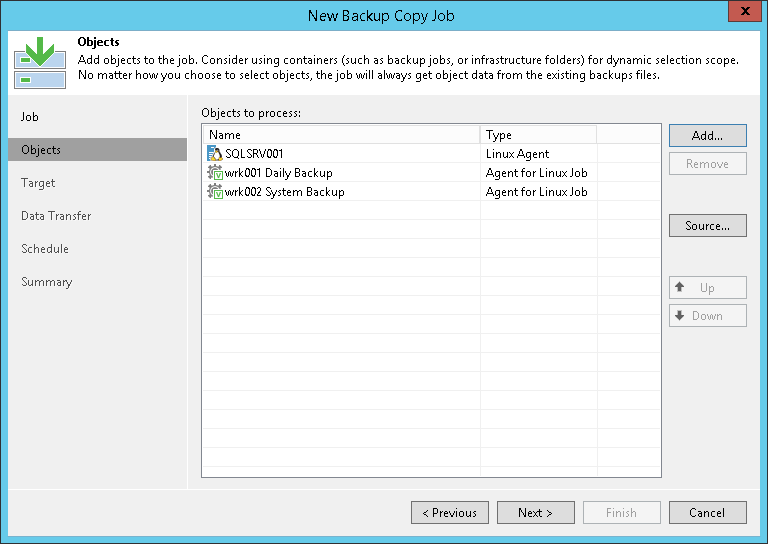 You can configure backup copy jobs that will copy backups created with Veeam Agent for Linux to a secondary backup repository. Backup copy jobs treat Veeam Agent for Linux backups as usual backup files. The backup copy job setup and processing procedures practically do not differ from the same procedures for a backup copy job that processes VM backups. To learn more about backup copy jobs, see the Backup Copy section in the Veeam Backup & Replication User Guide. You can process backups created by Veeam Agent for Linux only with backup copy jobs for Linux computer backups. You cannot add a Veeam Agent backup as an additional source of a backup copy job that processes VM backups. To overcome this limitation, you can delegate the restore task to backup administrators who work with Veeam Backup & Replication. Backup administrators can use Veeam Backup & Replication to export data contained in backup files as virtual disks.